Total quality management (TQM) is essential throughout all the systems development steps. According to Evans and Lindsay (2004), the primary elements of TQM are meaningful only when occurring in an organizational context that supports a comprehensive quality effort. It is in this context that the elements of customer focus, strategic planning and leadership, continuous improvement, empowerment, and teamwork are united to change employees’ behavior and, ultimately, the organization’s course. Notice that the concept of quality has broadened over the years to reflect an organizational, rather than an exclusively production, approach. Instead of conceiving of quality as controlling the number of defective products produced, quality is now thought of as an evolutionary process toward perfection that is referred to as total quality management. Systems analysts must be aware of the factors that are driving the interest in quality. It is important to realize that the increasing commitment of businesses to TQM fits extraordinarily well into the overall objectives for systems analysis and design. The advent of Six Sigma has changed the approach to quality management. Systems analysts and systems users need to be aware of Six Sigma and apply some of the principles to their systems analysis projects. Originally developed by Motorola in the 1980s, Six Sigma is more than a methodology; it is a culture built on quality. The goal of Six Sigma is to eliminate all defects. This applies to any product, service, or process. In operations management textbooks from the 1970s to the end of the century, quality control was expressed in terms of three standard deviations from the mean, or three sigma, which equals about 67,000 defects per million opportunities. Six Sigma implies a goal of no more than 3.4 defects per million opportunities. Six Sigma is a top-down approach. It requires a CEO to adopt the philosophy and an executive to serve as project champion. A Six Sigma project leader is called a Black Belt. (The metaphor of the Black Belt comes from the ranking system of capabilities in martial arts.) Black Belts are certified after they have successfully led projects. Other project members are called Green Belts. Master Black Belts are Black Belts who have worked on many projects and are available as a resource to project teams. 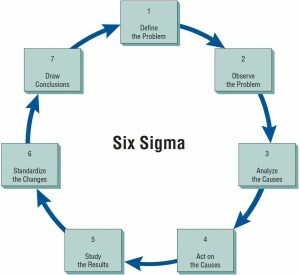 Six Sigma can be summarized as a methodology. The steps of Six Sigma are shown in the figure illustration below Six Sigma, however, is much more than a methodology; it is a philosophy and a culture. For more information on Six Sigma and quality management, visit the Web site for the Juran Center at the Carlson School of Management, University of Minnesota, Twin Cities (www.csom.umn.edu). In 2002 the Juran Center issued a proclamation to support and encourage quality. Every systems analyst should understand the methodology and philosophy of Six Sigma. The late Joseph M. Juran said, “All quality improvement occurs on a project-by-project basis and in no other way” (Juran, 1964). Systems analysts, project managers, and users should take that to heart.